Everything in the world was made of numbers. This was the truth, and Cho Ryu Hyang knew it. Because of this, he began to write a bunch of numbers on the paper in front of him. After a while, he handed the piece of paper to Ju Ho Yu. Ju Ho Yu looked at Cho Ryu Hyang and thought for a second. Tai Gonggong made an annoyed face when he saw this. Right now, Ju Ho Yu didn’t accomplish a single thing here. Wasn’t he supposed to be the person who impressed even the general? Tai Gonggong simply couldn’t believe that Ju Ho Yu was currently being dragged around by a child. Ju Ho Yu glanced at Cho Ryu Hyang. Gongson Chun Gi really did get himself a good heir. He had to admit that. He didn’t know much about martial arts, but regarding formations, this child was as skilled as he was, the strongest formations expert in the Imperial Palace. Ju Ho Yu looked at the child in front of him with a saddened face. There was a very good reason to kill this boy. The Imperial Palace disliked beings that could become potentially dangerous to them. Once he thought that much, he glanced down at the paper that the child had given him. Just what was the child trying to find out from him? He wasn’t the type of person who could be played by a mere child. He, laughing inside, began to observe the paper. Once he did, he was no longer able to laugh. He thought that he saw an illusion. But the more he looked at the paper, the more concerned he became. He couldn’t turn his eyes away from the paper. Ju Ho yu gripped onto the paper. To others, what was written on the paper may be simple numbers, but Ju Ho Yu saw something completely different. After looking at the paper for a long while, Ju Ho Yu let out a sigh, and looked up. His eyes held the emotion of confusion in them. He said this with a confused voice. His previous calm attitude was nowhere to be found. Cho Ryu Hyang didn’t mind it. He simply fixed up his glasses a bit. Cho Ryu Hyang nodded without knowing it as he looked at Ju Ho Yu. This person really was the real deal. The title “greatest mathematician” fit the man quite well. After thinking about what his teacher had told him about Ju Ho Yu, Cho Ryu Hyang opened his mouth. Ju Ho Yu shook his head. He had so many things to ask, but he just couldn’t organize them. But there was a single question that needed to be asked first. And the answer to that question would decide Cho Ryu Hyang’s fate. Ju Ho Yu’s face, at this moment, was as cold as ice. At this, Ju Ho Yu’s face turned even colder. Ju Ho Yu made a dumb face for a second. He immediately came back to his senses and asked a question. Ju Ho Yu’s face was filled with shock, then understanding. And in the end, it turned into a sorrowful face. Tai Gonggong made an annoyed face as he watched Ju Ho Yu’s face change at an extreme rate. Ju Ho Yu was unable to contain his cries at this time. Tai Gonggong tried to stop Ju Ho Yu, but the man had already begun to cry and slam the table with his fists. Tai Gonggong sweat profusely as he tried to stop Ju Ho Yu, but tears kept flowing out of Ju Ho Yu’s eyes. Cho Ryu Hyang opened his mouth as Tai Gonggong frantically tried to control Ju Ho Yu’s sobs. Ju Ho Yu, who turned into a slobbering mess in an instant, had surprised everyone except for Cho Ryu Hyang. Cho Ryu Hyang, too, was surprised by Ju Ho Yu’s extreme reactions, but as he already knew that Ju Ho Yu had known about Jo Gi Chun, he wasn’t greatly surprised. It was just that he felt something in his heart react to Ju Ho Yu’s fiery sobs. Cho Ryu Hyang immediately set out to control it. But that wasn’t as easy as he thought. The burning feeling in his heart spread to his entire body in an instant. The rage and pain that he suffered from when his teacher died was boiling up again. It was beginning to make Cho Ryu Hyang’s mental state lose balance as well. He did not forget the pain he had felt in the past. Because of that, he was planning on taking revenge for his teacher through the entire course of his life. As Cho Ryu Hyang tried his dest to control his emotions, Ju Ho Yu had wiped away his tears with the handkerchief that Tai Gonggong had given him and managed to talk. Cho Ryu Hyang nodded with reddened eyes. Ju Ho Yu grinned like a maniac, with tears and snot covering his face. 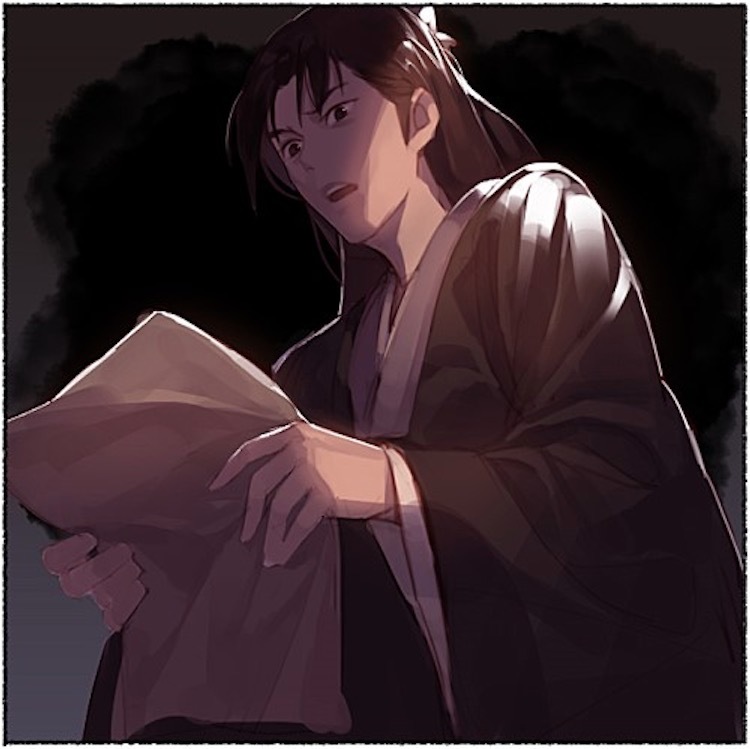 As Tai Gonggong became disgusted by such a face, Ju Ho Yu remembered the handkerchief in hand and tried to return it. When he did so, Tai Gonggong stepped away in disgust. Only then did Ju Ho Yu see the state of the handkerchief. He smiled embarrassedly and put it in his pocket. Tai Gonggong looked at Ju Ho Yu with a defeated face and shook his head. Ju Ho Yu watched Tai Gonggong walk away from him, then looked back at Cho Ryu Hyang. Ju Ho Yu was one of the few people who knew about Jo Gi Chun. To Cho Ryu Hyang, who wanted to know much about Jo Gi Chun, this was really a good opportunity. Cho Ryu Hyang hadn’t expected that he would meet a person like this while the Four Powers were attacking. He made a regretful face due to this. Ju Ho Yu, who understood Cho Ryu Hyang’s predicament, thought a bit, then opened his mouth. Ju Ho Yu made a confused face as he lifted the paper that Cho Ryu Hyang gave him. To others, this paper showed numbers, but Ju Ho Yu was able to see its true form. There was a picture of Jo Gi Chun drawn on it. Cho Ryu Hyang thought for a bit. This was something that was drawn based on Zhuge Liang’s picture that he saw in a book a long time back, but he didn’t know how to use it. Thankfully, it seemed that Ju Ho Yu thought that Jo Gi Chun was the one who came up with the idea. Cho Ryu Hyang thought about clearing things up, then decided not to. Ju Ho Yu looked at the paper for a while longer, then realized something and turned to Tai Gonggong. Tai Gonggong felt something from Ju Ho Yu’s gaze and looked away uncomfortably. They had originally come to stop the Four Powers. But the Church was already prepared. In that case, there was no need for them to do anything. But because of that, a problem arose. Tai Gonggong looked at Cho Ryu Hyang. Ju Ho Yu felt a chill run down his shoulders just then. Tai Gonggong’s gaze was something that resembled a predator looking at its prey. He had forgotten what this place was like because of Jo Gi Chun. The Imperial Palace was planning on getting rid of all martial artist groups in the world. Tai Gonggong was one of the core members who were involved in the plan. Ju Ho Yu revealed the talent of Cho Ryu Hyang in front of a person like that. Ju Ho Yu’s eyes shook. He wanted to beat the ground in regret. He showed too many things in front of Tai Gonggong. To Tai Gonggong, whose priority was always the Palace, Cho Ryu Hyang was someone who absolutely had to be killed. Ju Ho Yu knew how powerful Tai Gonggong was. And that Tai Gonggong made Cho Ryu Hyang a target. Ju Ho Yu due to this made a regretful face. Cho Ryu Hyang, however, seemed calm. He knew what Tai Gonggong was thinking at the moment, but he didn’t particularly feel anything from it. He simply took out a piece of paper and wrote something on it. Ju Ho Yu and Tai Gonggong. Along with them, everyone in the room carefully looked at Cho Ryu Hyang. Tai Gonggong observed every one of Cho Ryu Hyang’s actions. He knew instinctively that Cho Ryu Hyang was going to interfere with the actions of the Palace more than anyone else in the world. After a moment, Cho Ryu Hyang gave Ju Ho Yu a new piece of paper that was once again filled with numbers. Cho Ryu Hyang stood up with a cold face, then he left. Ju Ho Yu and Tai Gonggong were both struck dumb by Cho Ryu Hyang’s sudden actions. Ju Ho Yu came back to his senses and began to read the paper. After looking at the paper for a bit, a gasp of amazement came out. Tai Gonggong made a curious face, but Ju Ho Yu didn’t say anything. The paper had a sort of a “language” of numbers. Ju Ho Yu sat dumbly for a moment. It felt like he was hit on the head with a hammer. The child had been looking at everything with a much wider viewpoint than he. At first, he was jealous of the child taking in Jo Gi Chun as a teacher. Now, he was jealous of Jo Gi Chun having such a good disciple. Ju Ho Yu bitterly smiled as he looked at Tai Gonggong, who was asking him about the contents of the paper. At that moment, Ju Ho Yu felt something. He felt that the wariness that Tai Gonggong had towards him melted away just like that……..
Ju Ho Yu praised the child multiple times as he looked at the spot the boy had been sitting on. CRH is such a little badass, I hope to see how will he be when he grows up!